Today may see you getting some much-deserved approval or recognition from your peers. The Six of Wands refers to support, approval and acclaim, brought about by something you’ve worked hard to achieve. You may have been putting a lot of effort into your work and not even realizing that others have taken notice. Or you could be unexpectedly pulled aside by a loved one, just to tell you how much you’re loved and appreciated. 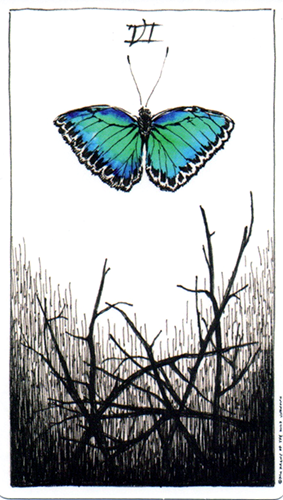 In this version of the card we see a beautiful blue butterfly emerging from a sparse landscape of dried-out brush. She may have just emerged from her cocoon and is now taking her maiden flight. This simple rendition perfectly depicts both the sense of “standing out in a crowd” and of “rising above triumphantly” that is so much a part of this archetype. The Six of Wands is a card of appreciation and admiration. You “win” something and have earned the right to be satisfied with the spoils of your victory. This isn’t about ego or conceit and it’s never at someone else’s expense. There’s a strong sense of being supported and lifted up by others who rejoice right along with you. You could be in line for a promotion or award at work. You could be given the ok to go ahead with a project you’ve been excited about. Or it may be as simple as pat on the back and some words of encouragement by those who look up to you. Whatever form this takes for you today, know that you’ve earned it and that you deserve it. It may just give you the incentive to keep shooting for the stars and manifesting your highest goals. Today’s tarotscope is part of the Wild Unknown Tarot series by Kim Krans. Used by generous permission. You can purchase this amazing deck directly from her website or from a variety of stores listed there. 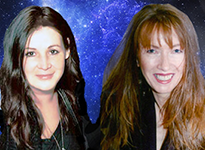 Please also visit and “like” the Wild Unknown Tarot Facebook Fan Page!